I have a confession. Besides a rinse here and there, my mats are dirty. I haven't scrubbed them in a year. That's really gross, considering I practice daily (and occasionally find my dog enjoying savasana whenever I leave a mat out). At least I'm the only one who uses my mats? Regardless, it was time for a good cleaning. I made my own mat wash, mostly because I didn't know where to look to purchase one here in Germany, but also because I knew I had all the ingredients to make my own. The spray smells so good, and you can be sure it's doing its job because the essential oils and witch hazel are antibacterial and anti-fungal. Ok here's what you'll need to do. Directions: Put everything in a spray bottle. 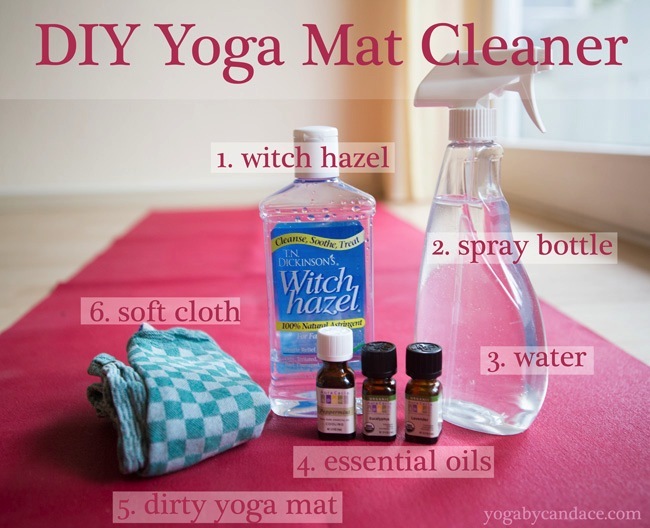 Shake, spray on the yoga mat, and wipe. PS- The importance of self-care (and my trip to Nice), a great pose for abs, and 4 reasons I love Florida.